Sales flier - New Formula "S"
This is a sales flier provided by the Quantum Division. It must have been an early one as the car is only shown as an illustration (rather than a photograph). This new single seater formula machine is designed to give you really satisfactory performance. It combines SAAB components, noted for the reliability and excellent response to tuning, with a thoroughly engineered, completely triangulated, light weight, extremely rigid chassis. The suspension geometry is patterned after current Formula 1 practice, using SAAB front A frames. This combined with a light fiberglass body with low frontal area, results in high cornering power and surprisingly low lap times. Formula "S" specifications provide for the use of all standard SAAB 750 or 850 engine components, except the latest oil injected GT Block. Metal may be removed from any engine part. This results in effective low cost tuning with excellent results, as much as 65 B.H.P. at 5600 R.P.M. with a single carburetor. A dynamometer developed 850cc 65 B.H.P. engine will be available from QUANTUM MOTORCAR CORP. on an exchange or outright basis for individuals who may not be that mechanically inclined. 1000 Derby Ave., Seymour, Conn. In no area has performance been subordinated to price, within the limitations inherent in using quantity produced components. The choice of the SAAB power unit has resulted in a most satisfactory compromise of low price, performance, reliablity and availability. The performance and appearance per dollar invested in Formula "S" exceeds what is offered by anyone in road racing today. 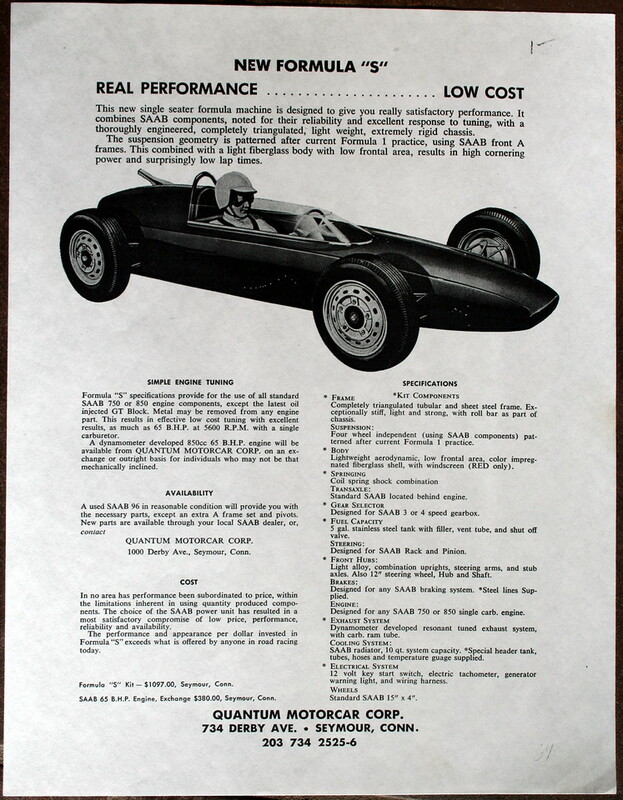 Formula "S" Kit - $1097.00, Seymour, Conn.
SAAB 65 B.H.P. Engine, Exchange $380.00, Seymour, Conn. Completely triangulated tubular and sheet steel frame. Exceptionally stiff, light and strong, with roll bar as part of chassis. Four wheel independent (using SAAB components) patterned after current Formula 1 practice. Lightweight aerodynamic, low frontal area, color impregnated fiberglass shell, with windscreen (RED only). Standard SAAB located behind engine. Designed for SAAB 3 or 4 speed gearbox. 5 gal. stainless tank with filler, vent tube, and shutoff valve. Designed for SAAB Rack and Pinion. Light alloy, combination uprights, steering arms, and stub axles. Also 12" steering wheel, Hub and Shaft. Designed for any SAAB braking system. *Steel lines Supplied. designed for any SAAB 750 or 850 single carb. engine. Dynamometer developed resonant tuned exhaust system, with carb, ram tube. SAAB radiator, 10 qt. system capacity. * Special header tank, tubes, hoses and temperature gauge supplied. 12 volt key start switch, electric tachometer, generator warning light, and wiring harness. Standard SAAB 15" x 4". Home Resources Quantum Division Sales flier - New Formula "S"